On LA's Skid Row, Homeless Women Seek Shelter From The Streets There are now 47,000 homeless people in and around Los Angeles. The number of homeless women living on the streets has increased dramatically, and many are at risk of violence and sexual assault. 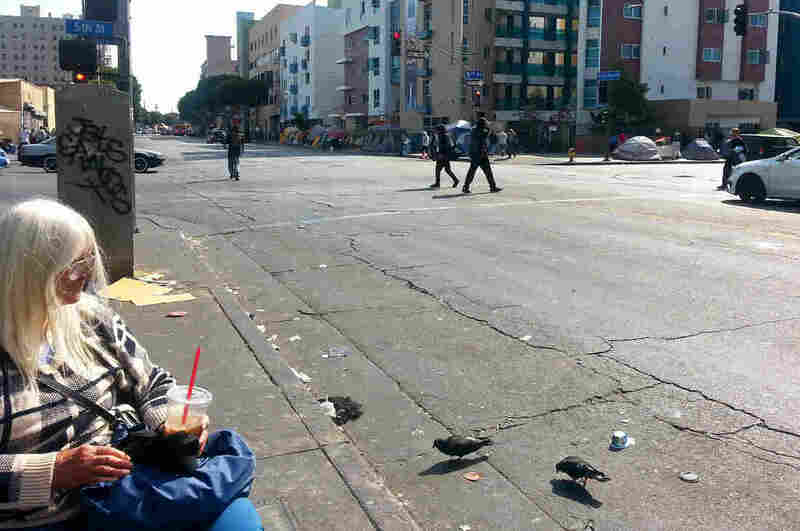 Sylvia Welker feeds the pigeons on Skid Row in Los Angeles. There are currently 47,000 homeless people in and around Los Angeles. Holding the coffee she received at Los Angeles's Downtown Women's Center, Sylvia Welker steers her electric wheelchair toward the curb. It's at this spot every day that she feeds the pigeons of LA's Skid Row. "The birds are maimed and deformed and beat and dying and hurting," Welker says. "I'm scared for the birds, but for me, I learned not to be afraid. It doesn't do any good. Fear isn't going to change anything." By taking care of the birds, the 71-year-old Welker keeps her mind off the dangers she and other homeless women face here. According to a recent count by the Los Angeles Homeless Services Authority, there are currently 47,000 homeless people in and around Los Angeles — up from 44,000 in 2015. The number of homeless women living on the streets has increased dramatically, up 55 percent since 2013. "The women are at the mercy of a lot of men that are pretty not right in the head," Welker says. "There's a lot of stalkers, there's a lot of predators, there's a lot of violence." Anne Miskey, CEO of the Downtown Women's Center, says being homeless itself is traumatic — in addition to the daily fear of physical danger. "We look at our women and we basically say 100 percent of them have been traumatized in some way or another," Miskey says. "For some it happened before they were homeless; 65 percent are victims of domestic violence, 45 percent sexual trauma." The Downtown Women's Center is only able to house 119 women. More than twice that number drop in each day for a meal, shower or health care. "I had one woman come in one day when I was walking through. She took my arm and said, 'Please, I can't do this anymore. I can't live on the streets anymore. I need a home.' And your heart just breaks because there aren't homes for all these women," Miskey says. Denise Gwendolyn Smith, 63, has been a been a permanent resident at the Center for two years. "I came downtown on Skid Row in 2003," Smith says. "That's when the bottom fell out of my life." Smith had a nervous breakdown. On Skid Row, she turned to drugs. That's the only thing that can get you through life on these streets, she says. "I saw killings," Smith says. "I saw, you know, people getting raped." In one of the Center's small classrooms, though, the sounds of the street fall away. Dawn Dorland is a creative writing instructor here. "This class isn't set up to be therapy but I do think it has a therapeutic benefit," Dorland says. "Giving these women this opportunity, they really just blossom." Vikki Vickers, a tall, 50-year-old woman in a hooded sweatshirt and jeans, spent four years on the street. She slept in alleys, mostly during daylight hours. "I'm absolutely one of the lucky ones. I would have been dead if I stayed out there another year," Vickers says. "I never will forget the emotion of hopelessness, of just wanting to die but being so mentally ill I didn't know how." When It Comes To Policing LA's Skid Row, What Tactics Work? Three years ago, Vickers moved into a studio apartment run by the center. She still needs to navigate Skid Row, but she has her life back — and a home. "I cook in a clean kitchen and watch TV," Vickers says. "And I take a shower. That's the big thing. I take a shower and sleep in a clean bed." By late afternoon, the women without a bed of their own are packing up their belongings. The Center's doors will soon close for the day. Outside, some of the women linger in the parking lot. Others move toward the sidewalk staking out a spot for the night. A shirtless man is holding a garbage can over his head, threatening anyone in his path.